Buses, Planes, Trains, Food and coffee. Yeah unfortunately they'll be reusing the old 100 stop in the middle of the loop. Instead of the one on the sidewalk. Quick update on marpole loop. They finished repaving the loop and are just letting the pavement cool before adding in all the charging equipment. The concrete bus stop pads are being poured within the next week or two. If they haven't started doing so already. 9704 with a green condo ad. Ahhhhh... I see what you did there. 😉 Touche. This doesn't look half bad. Some routes look a little too long, and/or too many stops. I'll get into more detail later on. Percentages don't matter if youve got no numbers to base it off of. We're too early in the planning stages to have any station layout ready. Ask again in 2020. Weight and size limits. As well as other restrictions. Thanks for the heads up. Was too tired to search. Some of the better ideas released to date. West Vancouver has always been a stick in the mud. It's like they never left the 1950s. West Vancouver isn't a small town anymore, and JFK isn't president. 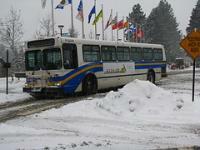 Should West Van not be okay, I say Translink goes for plan B and end it at Park Royal. Remember these are numbers from 2014 so things may have changed. You see why more 40ft buses are wrapped vs 60ft buses. Victoria and Kelowna charge $14,000 for a double decker wrap. As of 2014 of course. $7000 for a 40ft and $19,000 for a 60ft. Granted these are numbers from 2014, so I know they've changed by now.